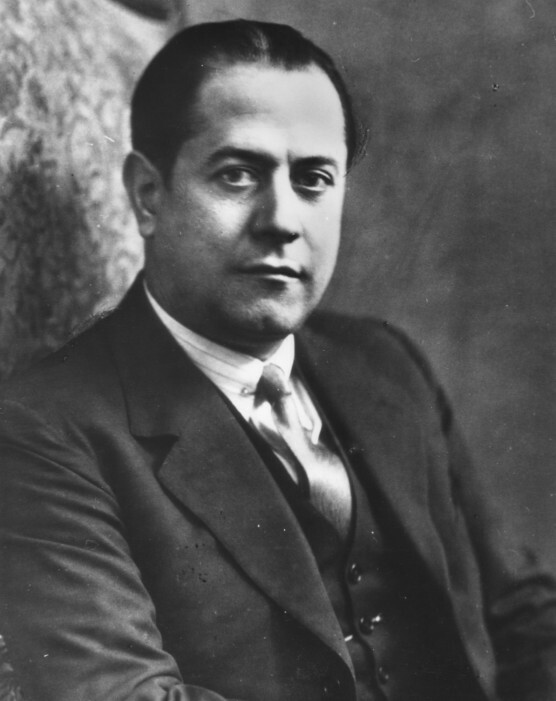 Capablanca’s three main books – My Chess Career (1920), Chess Fundamentals (1921) and A Primer of Chess (1935) – have undergone conversion, with mixed results. My Chess Career, his first book in English, was published a year before he became world champion. It had 35 annotated games, linked by an autobiographical narrative containing both self-praise (homed in on by some critics) and self-censure (ignored by almost all critics). The publishers, G. Bell & Sons, rose to the occasion and produced a stately, navy blue hardback; Capablanca’s signature was embossed in gold on the front cover, and there was a fine frontispiece portrait, protected by a translucent interleaf. That was chess book production in the lean aftermath of the Great War. What has happened to our game if, in the 1990s, we are reduced to limp opuscules like Garry Kasparov’s Chess Puzzle Book? Chess autobiographies hardly existed in 1920, and that year’s April issue of the American Chess Bulletin (pages 65-66) was entranced by My Chess Career: ‘Of all of Capablanca’s varied achievements none, we venture to say, will be hailed with greater delight than this his latest and best contribution to the literature of the game.’ In 1966 Dover Publications Inc. reissued the book with a new Introduction by Capablanca’s most impassioned cheer-leader, Irving Chernev. He described My Chess Career as one of the five most exciting chess books he had read. In 1994, Grandmasters Publishing of Corsicana, Texas brought out a coarse algebraic version, ‘newly edited and revised by Lyndon Laird’. The task sounds a clerical doddle, but Mr Laird highlighted the various pitfalls by side-stepping none of them. Cheap in all but price, his garish paperback extirpated the original book’s style, flavour and dignity. Labelled an ‘Expanded Edition’, it tagged on some 60 pages of extraneous material; among the unwarranted and unwanted partie-crashers were four Capablanca scores from Nottingham, 1936, with annotations by Alekhine. As early as page 5, the reader may have foreboding about Mr Laird’s credentials for the job. Richard Réti wrote that chess was Capablanca’s mother tongue, but in his Foreword Mr Laird bafflingly attributes this famous remark to Reuben Fine. 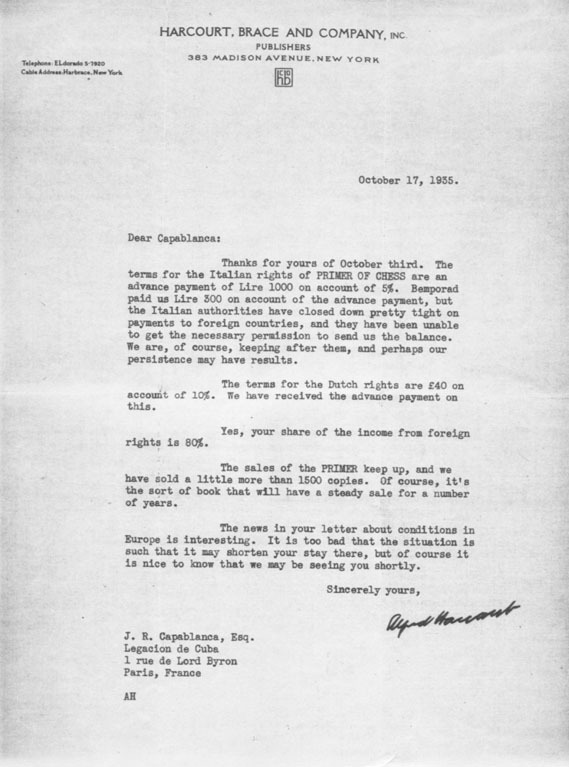 He nevertheless sees fit to make fussily redundant interjections throughout the text, though liable to be silent when a word of amendment is required. For example, at move 26 in Capablanca v Bernstein, St Petersburg, 1914 mate in three, not five, is possible. Unsurprisingly, mistakes have been added. At the end of Game 4, Capablanca v Raubitscheck, victory becomes defeat (‘0-1’ instead of ‘l-0’). Game 6, played in June 1908, is headed ‘1906-1908’, as if it were a correspondence epic. Game 22 (v Nimzowitsch) is also misdated. In Capablanca v Janowsky, San Sebastian, 1911 two gross annotational errors (confusion of the a- and h-pawns) have been made in Capablanca’s notes to his 52nd and 58th moves. Wanted: a respectful edition of My Chess Career from a responsible publisher. Caution and sobriety, rather than presumption and vulgarity, are the hallmarks of Cadogan Chess’s algebraic versions of Chess Fundamentals and A Primer of Chess, published in 1994 and 1995 respectively. Few stops have been pulled out in the production department, and in each case the algebraic paperback has roughly half as many pages as the descriptive hardback. There is no stopping progress. Nonetheless, Capablanca’s original texts are followed closely, to the extent that in A Primer of Chess even such slips as the move numbers on pages 128-129 and the year of two Euwe games on page 143 and page 146 have been left untouched. 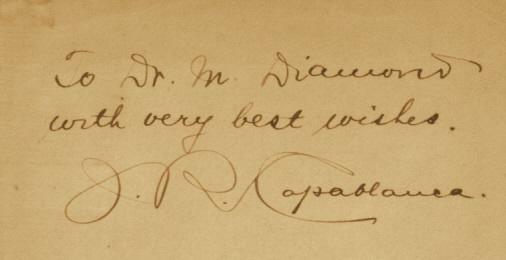 This is vintage Capablanca. Believing that he had written an outstanding book, he saw no reason to pretend otherwise. He has often been termed chary with analysis, although his ability to pinpoint succinctly a game’s critical moments is beyond dispute. The particularity of his prose style was its absence of style, its plainness. Simple vocabulary and simple syntax made him the antithesis of Nimzowitsch and Tartakower. Very much a literalist, in annotations he shunned figures of speech like similes and metaphors, as well as cultural references, paradox, humour and discursive matter, as if such additives would cloud his annotations’ pedagogical value. At their most skeletal (e.g. in his booklet on the match against Lasker) his notes inevitably disappointed, but whatever they lacked in colour they gained in clarity and timelessness. Owing to its direct, spare prose, Chess Fundamentals reads as naturally today as it did in 1921. Notwithstanding his oft-alleged ‘laziness’, Capablanca annotated more of his own games than is often realized: over 150. But he wrote fitfully (for example, hardly anything between 1928 and 1934), and for an overview of his career we must turn to third parties. In English the choice is between a pair of quinquagenarians, The Immortal Games of Capablanca by Fred Reinfeld (1942) and Capablanca’s Hundred Best Games of Chess by Harry Golombek (1947). The Reinfeld work, which has 113 games, first appeared nine months after Capablanca died. It was reprinted in 1990 by Dover, and there was another (1974) descriptive notation edition, from Collier Books, with an Introduction by Robert Byrne. The manifold factual mistakes in Reinfeld’s book remain uncorrected to this day, but overall it was not bad for its time. Dover’s blurb reminds us that Capablanca’s best games are ‘models of beauty, economy, clarity and imagination’. How often such words have been written, but how true they are. In the annotations Nunn decided to correct ‘minor’ analytical flaws without comment but to use footnotes in important cases. As ever, his observations are of much interest, an example being the game Marshall v Capablanca, New York, 1931. Play continued 21...Qxa4 22 Rxd6 Nbd5. 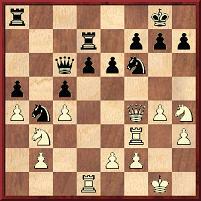 Golombek awards Black’s 22nd move an exclamation mark for being ‘a neat little combination, winning a pawn by force’. A footnote by Nunn disputes that: ‘The two players and Golombek all apparently overlooked the crushing move 23 Ra6! !, which wins material. After most replies White can just take the knight, while 23...Nxf4 24 Rxa8+ Rd8 25 Rxd8+ Ne8 26 Rxf4 g5 27 Rf3 gxh4 28 Nxc5 is also an easy win.’ Nunn writes that since Capablanca’s intended combination is unsound he should have preferred the quieter line 21...Ra6 22 g5 Ne8 23 Ra1 Rb7, ‘retaining some positional advantage’. Unfortunately, this judgement throws into disarray the reader’s understanding of the game as a whole, for earlier notes by Golombek are allowed to stand. He had nothing but praise for Capablanca in this game, and criticized White’s play at moves 7, 8, 10, 11, 14 and 15. Indeed, 15 a4 was castigated as ‘a blunder, after which the game is already past saving’. If that is all true, it is unclear why Black has only ‘some positional advantage’ after the play pointed out by Nunn at move 21. At their best Golombek’s notes were effective, but the Batsford book makes one realize that he was often careless in analysis, dogmatic about openings, indifferent to move transpositions and negligent about the chronological order of games. He was also hampered by restricted research material and limited awareness of Capablanca’s own annotations, despite some personal contact between the two players. (Batsford’s back-cover blurb errs in calling him an ‘occasional opponent of Capablanca’; they met at the board once only.) Another problem is Golombek’s prolixity. He liked the sound of his own typewriter, and some of his prose has, unlike Capablanca’s, dated badly. Even so, Batsford goes too far with its stylistic changes, which begin with the first word in the first note in the first game. Above all, Golombek’s selection of games looks increasingly inapt and unrepresentative, and in this respect Reinfeld may already have performed better in his earlier book, which Golombek haughtily ignored (apart from slavishly copying its shambolic tournament and match result tables). 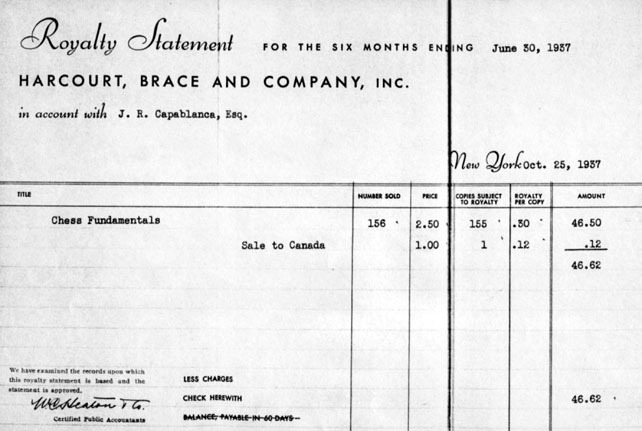 Knowledge of Capablanca’s career has advanced enormously since the 1940s. In 1963 came the Weltgeschichte des Schachs monograph by James Gilchrist and David Hooper, a collection of tournament and match games so thoroughly researched that little could be added even now. In 1975 David Hooper and Dale Brandreth produced The Unknown Capablanca (descriptive notation), a complementary anthology of games from events other than tournaments and formal matches. Its sole drawback, Batsford’s hit-or-miss typesetting, was rectified in a 1993 Dover reprint. Published by the Oxford University Press in 1978 and reprinted by Dover in 1982, Capablanca’s Best Chess Endings by Irving Chernev presents (in full algebraic notation) 60 complete games, annotated with emphasis on the final phase. Well over half are absent from the Golombek volume, a fact which underscores not only the inadequacy of Golombek’s selection but also Chernev’s readiness to embrace newly-found material. Written with deceptive casualness, Capablanca’s Best Chess Endings was, perhaps, Chernev’s finest book, combining hard analytical work and his customary screwball levity. Only Chernev could write annotations like (page 169) ‘“Don’t simplify against Capablanca!”, I keep telling them at the office’. Since the 1970s, investigations have continued apace. We attempted to shed additional light in our 1989 book published by McFarland & Co., Capablanca: A Compendium of Games, Notes, Articles, Correspondence, Illustrations and Other Rare Archival Materials on the Cuban Chess Genius José Raúl Capablanca, 1888-1942. 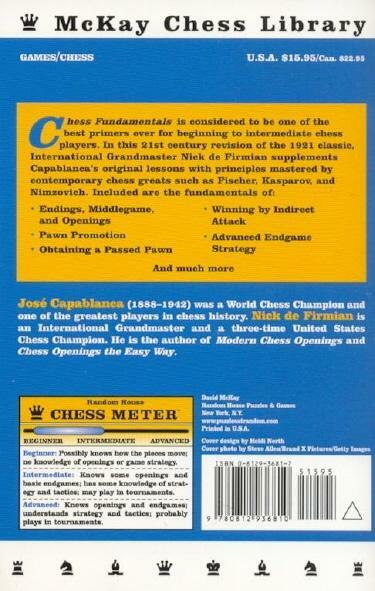 Then came The Games of José Raúl Capablanca (Caissa Editions, 1991, with a revised version from Chess Digest in 1994). 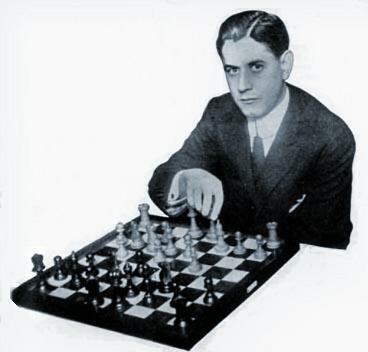 Its readers should exercise caution and scepticism, given the extreme slackness of the compiler, Rogelio Caparrós, a kind of Lyndon Laird squared, but, if nothing else, the number of games gathered (over 1,200 bare scores) reinforces the point that any modern writer wishing to cream off Capablanca’s hundred best will have infinitely more raw material to choose from than did Golombek. To do justice to Capablanca, however, an anthology of at least 200 annotated games is surely needed. Pending the realization of that dream, Golombek’s book will have to suffice. It is not a particularly attractive stand-in, even after its algebraic face-lift. Afterword: ‘Capablanca Goes Algebraic’ first appeared on pages 43-45 of CHESS, March 1997. Later that year Chess Stars brought out a two-volume set of Capablanca’s ‘complete’ tournament and match games, with languageless annotations, but an anthology of the kind mentioned in the final paragraph above is still awaited. 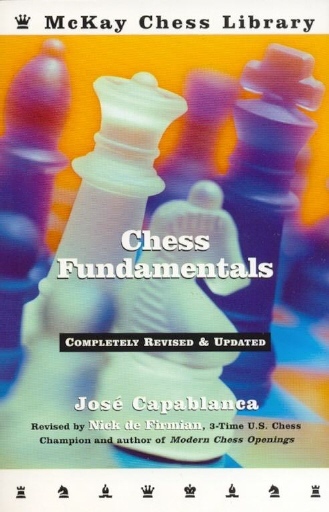 The answer is that all of them were annotated in depth by Capablanca in the ‘Illustrative Games’ section of Chess Fundamentals and all of them were chopped out of the ‘completely revised & updated’ edition by Nick de Firmian (Random House, New York, 2006). Their removal made space for some newer games, including five and a half pages devoted to N. de Firmian v P. Youngworth, Lone Pine, 1980. C.N. 4368 expressed the hope that anyone who chose to sell the book would at least warn prospective purchasers about what Mr de Firmian had done, the above being, alas, just one example. Latest update: 25 January 2019.